http://www.youtube.com/watch?v=944cPciN-kw Here is a video that most 20-somethings will remember. 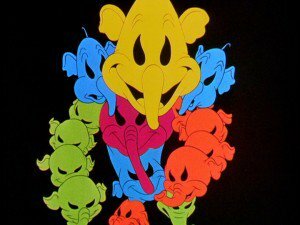 It is the creepy scene from Disney's Dumbo. I'm 27 and this clip is still a little bit creepy. Look out! Look out! Pink elephants on parade Here they come! Hippety hoppety They're here and there Pink elephants ev'rywhere Look out! Look out! They're walking around the bed On their head Clippety cloppety Arrayed in braid Pink elephants on parade What'll I do? What'll I do? What an unusual view! I could stand the sight of worms And look at microscopic germs But technicolor pachyderms Is really much for me I am not the type to faint When things are odd or things are quaint But seeing things you know that ain't Can certainly give you an awful fright! What a sight! Chase 'em away! Chase 'em away! I'm afraid need your aid Pink elephants on parade! Pink elephants! Pink elephants!